The time has come to go to Jerusalem. All the things the prophets have foretold concerning the Son of Man shall now be accomplished. Now nothing is impossible. Jesus, God crucified, draws us into the beauty of God’s desire for us. Jesus smashes the barrier so we can hear the Father say over and over to us, “I know well the plans I have in mind for you, plans for your welfare, not for woe! Plans to give you a future full of hope. When you call me, when you go to pray to me, I will listen to you. When you look for me, you will find me. Yes, when you seek me with all your heart, you will find me with you, and I will change your lot.” Jer 29.11-14. The wounded, risen Jesus makes this tenderness of the Father available to us at every moment. God in Christ is wounded by our sins just as we are, but his wounding means our transformation and the revelation of the unending availability of his mercy. Still it takes courage to gaze upon the passion-gashed Jesus. For he shows us who are and who we are meant to be: never poor victims of our sins and bad choices, never hapless victims of our sin-filled histories, never wounded wounders but wounded forgivers like him. Jesus has been wounded by his loving us unto death. He invites us to go and do likewise. Looking upon him, we see ourselves, our own sorrow as well as the anguish and distress of so many of our sisters and brothers in need. We pray that our own hearts will be stretched opened in compassion, as the heart of Jesus was broken open by the soldier’s lance. * Insight from James Alison. 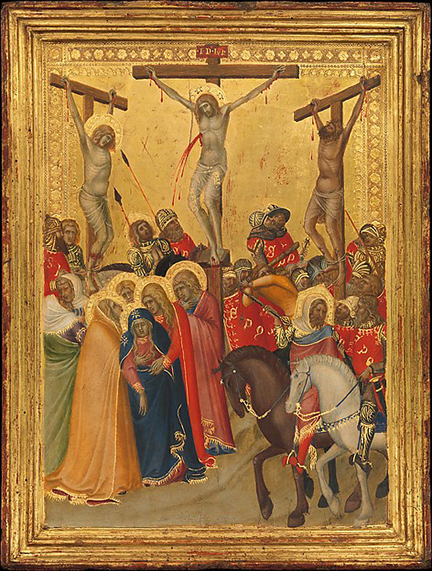 The Crucifixion, Pietro Lorenzetti (Italian, active Siena 1320–44), 1340s, tempera and gold leaf on wood, 16 1/2 x 12 1/2 in. The Metropolitan Museum of Art. Used with permission.